[無料] EtreZip | Mac App Storeのアプリ検索・ランキング BuzzMac! 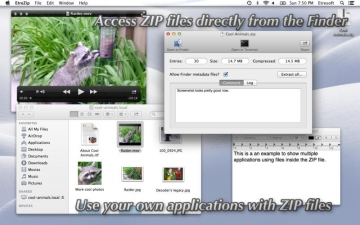 EtreZip allows you to open ZIP files directly in the Finder. No need to decompress. After opening a ZIP file with EtreZip, you can access the ZIP file as if it were a network drive. EtreZip provides full read and write access to the ZIP file. Just open a ZIP file in the Finder and make your changes. 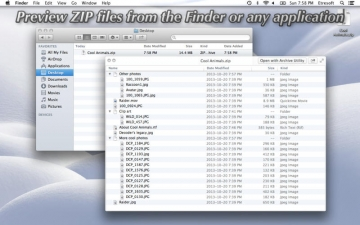 EtreZip’s user interface consists of the Finder and your other applications. EtreZip doesn't compete for your time. It brings new capabilities to the Finder and your own favourite applications. EtreZip keeps .DS_Store files and __MACOSX folders out of ZIP files unless you want them there. 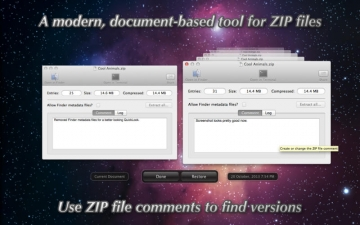 EtreZip’s ZIP files are fully compabible with the the native ZIP software in OS X. EtreZip supports Finder ZIP files larger than 4 GB and the ZIP 64 standard. EtreZip opens not just ZIP files. It also opens any document type like EPUB or DOCX that is actually a ZIP in disguise. EtreZip includes a QuickLook plug-in to display the contents of any ZIP file by pressing the space bar in the Finder or any application’s file open dialog.